Thank you very much. Asalam Aleikem. I appreciate the Muslim Students for Justice for organizing of this event, especially brother Borna Danesh for inviting me to speak in front of you here today. We have gathered here today on the International Al Quds Day. This is the day that many communities observe, to show solidarity with the suffering Palestinian people. This is a day to remember Al Quds, Jerusalem, a city which is referred to, as the city of peace; to remember the land of Palestine, which is referred to, as the Holy Land; and to remember the Palestinian people who have a long history as a peace-loving people. The land of Palestine is just one example of many other Muslim and Arab countries, where a beautiful coexistence took place, between the Muslim majority and the G-d-fearing Jewish minority. Those Jews were loyal citizens within the Muslim population, they were respected by their peace- loving neighbors and lived in total brotherhood. This reality of history proves wrong today's propaganda and the mainstream media, which tries to show an image of Muslims as having an ingrained hatred towards Jews, just because they are Jews, that they have always hated Jews, and that the conflict that we see today in the Middle East is a religious conflict, rooted in the differences of our religions. This all leads to the conclusion that all Muslims, and whoever else opposes the State of Israel, are anti-Semites. But nothing could be farther from the truth. They are many people from the older generation that still remember the old history. I personally meet on many occasions elders from the Muslim community who tell stories of the peaceful coexistence between the Arabs and the Jews in many Muslim countries, including Palestine. There are older Rabbis still in the Jewish communities who remember how they would even trust the Arab neighbors to babysit their children, and how their neighbors used to help them on the Jewish Sabbath and holidays. Now the question is, when did this history change? When was this peace destroyed?Â What change took place to that disrupted this coexistence, and why do we find today a rift and mistrust between our peoples, Jews and Arabs? All of this began only with the invention of the philosophy of Zionism, and later on when it became a reality with the construction of the state of "Israel". It began with Zionism's plan to create a "Jewish Homeland" on the land and on the properties of others. Â The Zionists in those days claimed that Palestine was "a land without a people, for a people without a land. "Â At that time the mistrust arose and the conflict began, which unfortunately led to what we see today, this unfortunate bloody conflict. But people think that the philosophy of Zionism and the actions of the state of "Israel" are supported by all Jews and justified by the Torah, the Jewish religion. 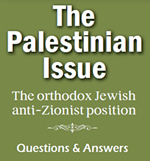 Many people don't know the history of Orthodox Jewish opposition to Zionism. From the very outset of Zionism, almost all Jewish Rabbis in Europe and in Palestine stood up in vehement opposition to it and later to the creation of the state of "Israel". The Rabbis, already in those days, foresaw what most Jews did not foresee. They warned that this new philosophy would only lead to catastrophe, since it was a rebellion against the Almighty and evil in its essence. According to Jewish teachings, at the time of the destruction of the Second Temple 2000 years ago, Jews were placed in exile by Divine decree. At that time, Jews were warned by G-d not to create their own sovereign state. Jews are forbidden to fight against any of the nations among which they live. Jews are required to be loyal citizens in the countries where they reside, to practice their religion and serve the Almighty, without having political aspirations or building any political movements. -- When Zionism came, it transformed Judaism from a religion to serve the One G-d, into a nationalism, void of G-dliness, a movement oriented solely toward political goals. Therefore, the philosophy of Zionism and the state of "Israel" are forbidden according to Judaism, even if the state had truly been created in a land without a people. But the fact that the state was created in an inhabited land, the land belonging to the Palestinian people, and it was accomplished by killing, oppressing, subjugating and expelling the indigenous inhabitants of the land, makes the crime much worse. Because, in addition to violating the theological principles of Judaism, it transgresses all the other laws of the Torah. It says in the Ten Commandments, "Thou shalt not kill," and "Thou shalt not steal." Judaism teaches, "What you don't want done to yourself, don't do unto others." Therefore, due to all of the above, Jews true to Judaism in many lands and communities throughout the world, even today, oppose the philosophy of Zionism and the State of Israel. They condemn the brutal occupation of Palestine for decades, the atrocities in Gaza for almost 2 years and the vicious attack on the Freedom Flotilla just recently. Aside from the fact that these are crimes against human rights and violations of international law, crimes that should pain and disturb every righteous human being, this pains us as Jews especially because all of this is being committed in our name. This causes us great embarrassment. We have sent twice delegations to visit the Gaza Strip, - to bring medical aid and crucially needed material to this terribly suffering people, and we sent a delegation to visit the wounded of the Flotilla in the hospital in Ankara, Turkey, to bring to the suffering people the message of sympathy from many communities worldwide, and to clarify that the Zionists with their crimes cannot claim to act in the name of the entire Jewish people. We all need to feel the suffering and the pain of the people of Palestine. Why? Because we are human beings and we have to feel for our fellow human beings. Jewish people especially should feel this because Judaism teaches us to have compassion for suffering people. Jews unfortunately know what suffering is. Our Jewish community comes from Europe. It is our grandparents, our relatives, who were murdered and tortured in the Holocaust. We know what suffering means and we don't want anyone else to experience it. And there is another point. We stand with the Palestinian people because we are victims of Zionism as well. Our people, our anti-Zionist communities in the Holy Land, suffer at the hands of the Israeli government for their vocal opposition to them. These Jews are oppressed, brutally beaten, imprisoned and interrogated in prison. This is not only today; this has been going on since 1948. Rabbis who are no longer with us sat in prison the previous generations, and we have people sitting in prison today, as we speak. We are embarrassed over what is happening in Palestine because it is being done in the name of Â the entire Jewish community, with the power of the media which presents it in this light.Â But we are even more ashamed and embarrassed when the impression is given that our religion, the holy Torah, supports the most extreme form of Zionism. 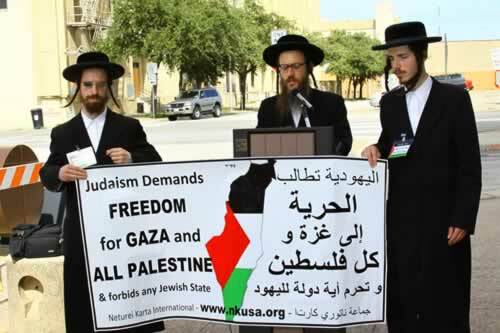 Lately we have seen radical so-called rabbis, paid puppets of the State of Israel, stand up and spread messages of hate: so-called Rabbi Ovadiah Yosef and so-called Rabbi Yitzchak Shapiro, to legitimize the evils of Zionism according to the Torah. But in no way do they speak in the name of all Jews, nor in the name of the Jewish religion. They speak only for themselves and perhaps some of their followers. According to Judaism, since the state of Israel and the philosophy of Zionism are totally evil and unjust, against humanity, against G-d and against religion, we believe that no lasting peace can be achieved as long as the state of "Israel" continues to exist in any part of Palestine. Today, as we stand here on International Al-Quds day, we need to remember the occupied people in Palestine in general, the suffering people in Gaza in particular, and also the oppressed religious Jewish community in Jerusalem. And at the same time we also need to remember the past history of the peaceful coexistence between the Jewish community and the Muslim community in every Muslim country, including Palestine, a coexistence that is unfortunately now destroyed, due to Zionism. But we need to understand that Zionism is only a political movement, and once this political movement is set aside, there is hope for a nicer future and a lasting peace. We need to remember that the State of Israel and all its actions do not represent world Jewry, and certainly not the Jewish religion and the Holy Torah. Traditional Jews are peace-loving people and so are the Palestinian people and the Muslim people in general. In conclusion, we should all pray to the Almighty for the speedy and peaceful dismantlement of the entire state of "Israel." We pray that this should take place peacefully without any more suffering of any people. Once the political movement of Zionism no longer exists, Jews and Muslims will be able to enjoy the old historic harmonic coexistence, without any more suffering or bloodshed, as they lived in the past. Ultimately, let us pray to the Almighty for the day when the glory of the Almighty will be revealed to the entire universe, when all people recognize the One G-d and serve him together in peace and harmony.